This is by no means a "Jeeping" trail. Well..., my wife imagines it is - she does not want to get her car dusty on the gravel portion of the trip. 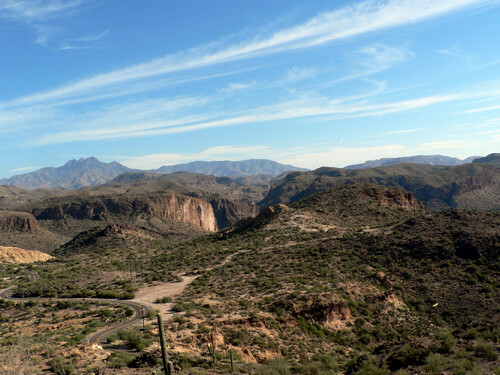 This is a beautiful and historic road from Apache Junction to Roosevelt Lake. Suitable for all vehicles. 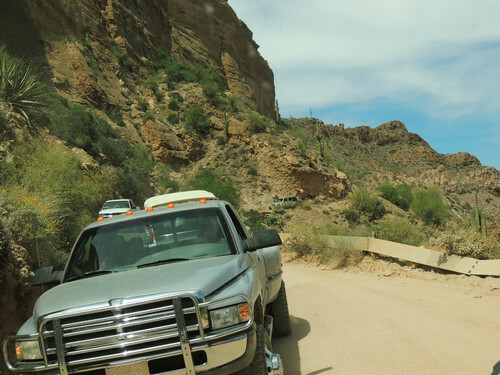 The road is paved from Apache Junction to a few miles north of Tortilla Flat. 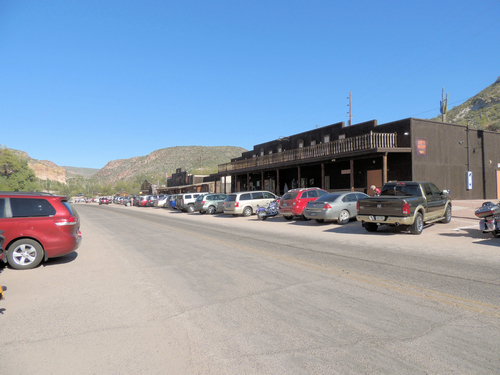 Tortilla Flats is a tourist trap, but is a good spot to stop for a burger or ice cream. The northern unpaved part is a wide graded road, but it can be extremely dusty with many areas of washboard. Traffic can be slow when winter visitor season is at the peak. ​This track includes a side trip to Reavis Ranch trailhead. 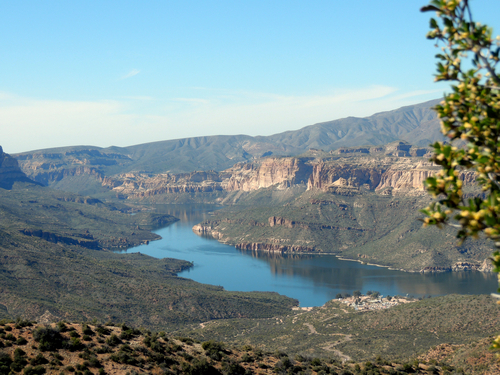 This is a nice diversion on a less traveled road to a beautiful overlook of Apache Lake. 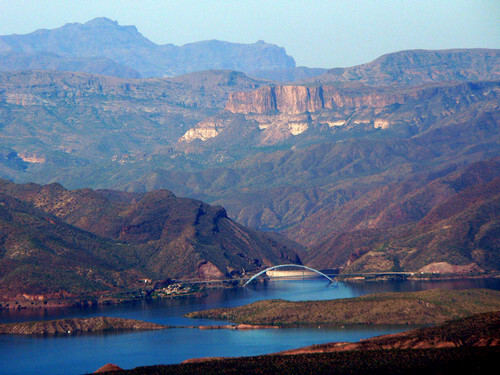 Apache Trail was built to allow construction of Roosevelt Lake which was completed in 1911. This was the first step in the "Salt River Project" which harnessed the Salt River to provide electricity, flood control and irrigation to the Phoenix area. Roosevelt Lake is the largest and uppermost lake in the project. There are 3 more dams/lakes lower down along the Salt River as it drops through the canyon. You will pass Canyon and Apache Lakes on this trip. The southern portion of the trail is paved and passes through very scenic country. There are several stops that explain the history of the area. Fish Creek Hill is an interesting section of the trail. It is a narrow, winding road in the side of a cliff. It would be an extremely easy Jeep trail, but city folks can get very uptight when driving it with their cars. The guard rails are very old and not well maintained and the corners are blind. 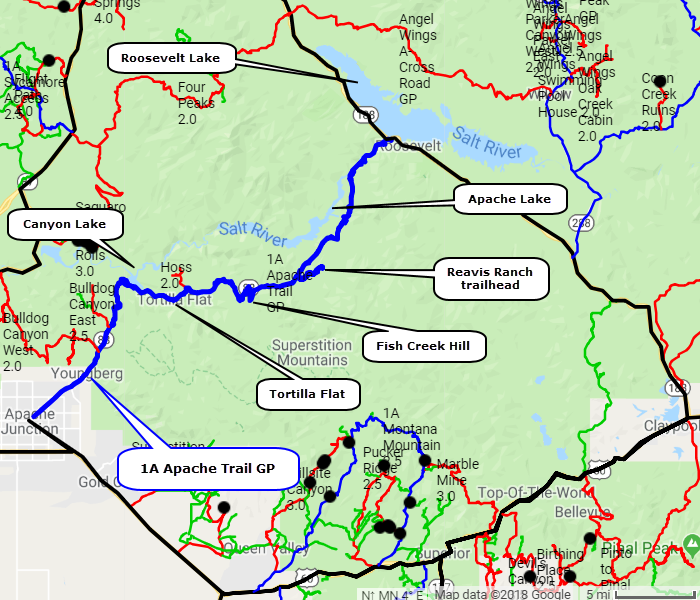 The Apache Trail is a State Highway, so many GPS devices will route traffic along it. Not a good thing.